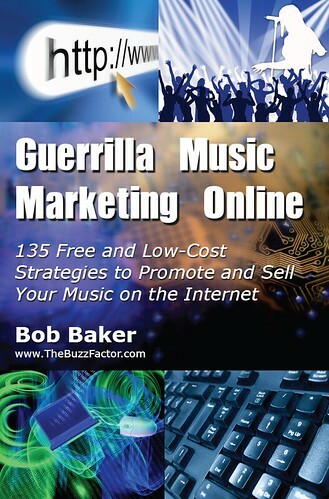 Bob Baker's Indie Music Promotion Blog: Get Your Name in My Next Book: "Guerrilla Music Marketing Online"
Get Your Name in My Next Book: "Guerrilla Music Marketing Online"
Kathleen Gage called it "One of the most creative book launches I have seen." She is talking about what I started doing last week, when I opened the door to a way my readers and supporters can get their name in my next book -- and start reading it now! I'm about to publish my 8th paperback book. It's the third title in my "Guerrilla Music Marketing" series. And I'm offering a way for you to get your name in it ... and also be part of a select Advanced Group to start reading it now and give me feedback that will make the final version (due January 2011) even better. will be my best resource to date. I won't bore you with the details here. So go to the official Guerrilla Music Marketing Online page to learn more. P.S. Did you enjoy this blog post? Get more tips like these when you subscribe to my Buzz Factor music ezine -- the longest running music career tips email newsletter on the planet. Since 1995. Go grab your free subscription now.